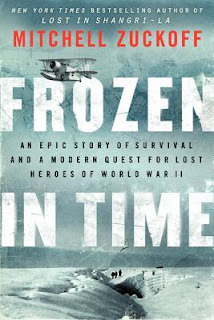 Frozen in Time is indeed one of those epic stories of survival that boggle the mind and rally us to think the best of our fellow man when they've undergone horrible trials and have risen to the challenge beautifully. Written by Mitchell Zuckoff, this is a true story of three downed planes and the men inside of them, lost out in the Arctic wilderness. In 1942, the Americans and the British were anxious to occupy Greenland because it is said that weather starts in Greenland. You know what the weather will be like in Europe a week or so prior to if you know the current weather situation in Greenland. Germany was also interested in the country for this reason and the Allies were anxious to beat them to it. After all, the country who knows the weather can make the best decisions for their troops and theoretically win the war. In November of 1942, a US cargo plane slammed into an ice cap in Greenland. Four days later, a B-17 was assigned a search-and-rescue mission for the cargo plane and its occupants. The B-17 also crashed. In an attempt to rescue the men aboard the B-17, a Grumman Duck amphibious plane was sent their direction, only to fly into a severe storm. The Duck also vanished. Frozen in Time tells us the story of the crew on the B-17 and of how they coped and survived on the ice for over 140 days. It also tells of the modern day expedition to find and recover the Duck and its crewmen. As you might imagine, it would not be an altogether pleasurable experience to be exposed to cruel elements for even a short time, let alone 140 days. It was (and is) so cold in Greenland during the winter time that snow instantly sticks and freezes to surfaces and the threat of being buried alive is a real danger. The crew mates were short on rations and long on time more frequently than not. The darkness which pervades the land during most of the winter brought several of the men to the brink of insanity more than once. Yet still they managed to rally themselves to fight on, thinking of their families and dreaming of life in a warmer climate. Frozen in Time tells a truly remarkable and unique story and that makes it a curious read. It speaks of adventure, courage, grit and hope. That said, the writing style of Mitchell Zuckoff leaves a lot to be desired, in my opinion. The idea of flipping back and forth from 1942 to the present day, telling of the men and then the current recovery efforts didn't need to be distracting but, I felt, it was. Zuckoff spends a lot of time explaining how the leader of the expedition to recover the Duck, Lou Sapienza, is highly dependent on the practicality and available finances of others to accomplish the things in life which he finds himself pursuing. I didn't much care for the way that Sapienza is constantly draining money from others (also living off of his current girlfriend and whoever else will sponsor his existence) without wanting to put much work into making money to support his ambitions. He seems horribly lazy to me. I also didn't care for the fact that Zuckoff made me feel this way towards Sapienza, since Zuckoff confesses that he willingly handed over his own credit card to fund their 2012 recovery mission. He seems to resent having put money towards the expedition, complains about Sapienza endlessly, all while wanting to be able to write this book. He wants to be able to tell as complete a story about The Duck as he can, he realizes he cannot do this alone, but he resents the person driving the effort. It isn't very pretty to read. In short, I really enjoyed reading the history of the 1942/43 veterans who gave their all to stay alive and contribute towards the war effort. I'm not so keen on hearing about how Zuckoff and Sapienza were both out to get the best deal for themselves for the sake of notoriety and a book. If this is not what Zuckoff meant to communicate to his reader, then he made some ghastly mistakes in his writing. Chiefly, he slammed Sapiena's character while simultaneously mooching off his dreams. Neither of these modern men are very interesting to me and I confess to skimming through the chapters detailing their stress-filled recovery efforts. Also of notable interest, apparently all servicemen in WWII were disarmingly handsome, rugged, good-looking, etc., if you are to believe Zuckoff. Eventually I found the physical descriptions of the servicemen to be hilarious. Every time a new name would pop up I would wonder to myself how they would be described and it was always in a most flattering light. Regardless of what the pictures tell me of the men, the stories of their courage and bravery in what would be an altogether depressing and defeating circumstances tells me what they ought most to be admired for. Good character trumps good looks any day of the week. An ugly man who survived on a Greenland glacier for 140 days would be intriguing and admirable just as well as not. To summarize - this isn't my favorite book about survivors in World War II. Yet it was still interesting because it is such a unique circumstance. i would have liked it more if Zuckoff wasn't trying so very hard to make me like him. In that, he failed. Still, many thanks to the publisher, Harper Collins, for shooting a copy of this book my way in exchange for my honest opinion. Bleh. I thought this book sounded really interesting based on the historical aspect--but the modern-day part sounds awful. Which means that, though I'm not adding this book to my TBR list, I'll probably end up picking it up at the library years from now--and will remember your review of it once I've started reading. Intriguing story. I can't imagine enduring such conditions. The modern part, the author's story, sounds considerably less interesting, and I'd probably skip over that as well. Thanks for the review! I prefer straight out of the mouth stories. Interesting and off-putting all at once? I will pass on this one though parts do sound intriguing and made me think of Unbroken. Great review! Too bad the modern ego had to take such a large part of the book, but it sounds interesting nonetheless. Maybe not as good as Alive: The Story of the Andes Survivors then? I think I have this one on my library list though it's probably going to be quite awhile before I get to it, if I ever will. I can't even imagine being stuck in a place where the darkness drives people to the bring of insanity. What a crazy story! I didn't know that Greenland was so coveted during the war. Sounds like a fascinating book. Adding this. You had me at " lost out in the arctic wilderness." I have a weakness for adventure stories, but you know this.